Sitting here in the wintery world of ski-season, quads wonderfully shredded from 3 days finding off-piste fun, I started thinking about some compression tights to wear pre and post exercise. 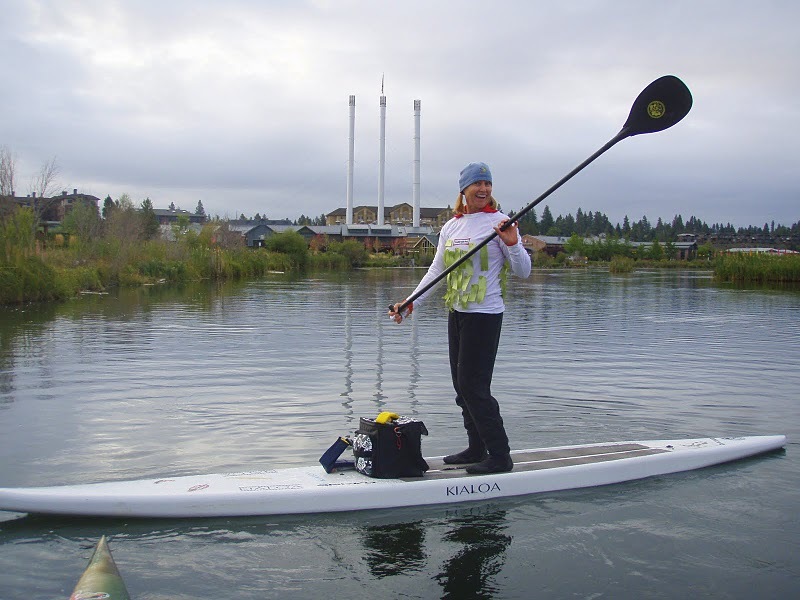 I remembered that Karen Wrenn was wearing something when she visited one of our river races last summer so I took a quick look at her website to determine what brand was good for SUP. Bummer, I can’t tell from this photo. No problem though. I had the chance to explore Karen’s website and blog – great information right when I need it. Just in time for paddling season this year I will be turning 63 (for real???) and staying ready to paddle in races and long tours is a priority. I “enter” races but I don’t “race.” While every stroke is the strongest I can muster at the time, and the camaraderie of the race is so much fun, I am usually the last to cross the finish line on my 11’3″ Amundson. Occasionally I borrow a race board, most recently from Dave and Meg at Kialoa, but my agenda is all about the paddle in the water, the connection between heart/lungs/muscle/sights/sounds and friends on the water. Training for all that is important. Reading about Karen’s busy life as mother of three and the off-season whether she deals with in Portland was inspiring. She suggests ways to stay motivated and carving out the 45 minutes or so needed to stay in shape. Especially interesting is her explanation of her cross-training routine. On her blog, Karen explains, “Circuit training is great because you can get your heart rate going, build muscle and muscle endurance. I will first do something that elevates my heart rate followed by a couple exercises that include strength and balance. For example, I might do 20 double jumps (or you could do 100-150 single jumps) with a jump rope and then move right into 20 kettle ball swings (from a squat position swinging the kettle ball to shoulder height coming to a standing position) and repeat. Then I would move into a plank position with elbows on a ball and roll the ball forward and back for 20 reps. I would do this circuit 3 times and then move on to another circuit. Another idea of a circuit is to do 15 split jumps on each leg (http://www.livestrong.com/video/5310-split-jumps/) and then 20 tri-cep dips then 20 reverse crunches (http://www.youtube.com/watch?v=vVVlXA0dqGg) and repeat this circuit another two times. Basically, come up with some circuits of three exercises. Have the first exercise of the series be something that will elevate your heart rate ( jump rope, running stairs, sprints on a rowing machine) add a strength exercise ( kettle bells, push ups, tricep dips, pull ups, etc…) then add in a core exercise ( reverse crunch, plank, medicine ball sit up and throws). After you finish one circuit of three then move on to another. Bye, for now! I am heading to the gym and then to the trail. SUP season will be here before we know it. How do YOU train off-season? This entry was posted in Journeys and Quests, People, SUP Fitness, SUP Racing and tagged amundson, compression tights, ElderSUP, karen wrenn, kettle ball, Kialoa, SUP fitness by Water Words. Bookmark the permalink.